Byte Name Units Scalar Offset Min Max Signed? 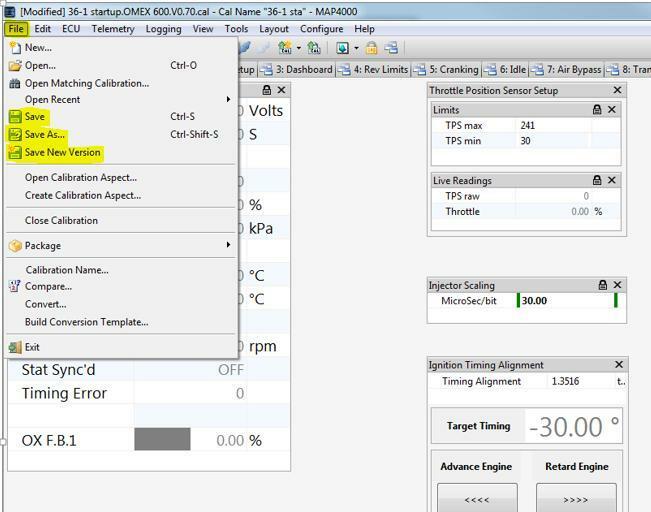 The OMEX ECUs can be tuned using MAP3000 or MAP4000. Below are the steps to take when using either of the two softwares. Please take note of the one suitable to your application. OMEX MAP3000 software is used to configure the ECU to output these data channels. This is carried out by selecting the “telemetry setup” option from the “user advanced” menu. Load the .sts file from the CD supplied with the ECU Serial Interface to automatically load the correct channel settings, or select the channels manually. If using MAP4000 software, the ECU must be connected to the PC in a different way ECU > Connect must not be used. Instead a copy of the calibration must be saved on the PC used for mapping. 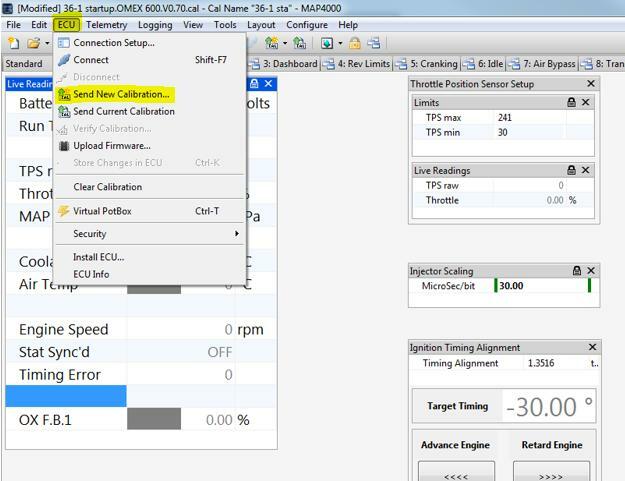 When starting a new session in MAP4000, the existing calibration must be resent to the ECU using ECU > Send New Calibration Shown in the below image. Whilst calibrating the ECU, it is important to periodically save any changes made to the map, to ensure that the calibration file is safe in the event of the PC shutting down unexpectedly. Any of the below options can be used to save the file. Please Note: If the copy of calibration in the ECU is lost and the software has been closed since the last connection, it will not be possible to recover the calibration. The calibration process will need to be restarted. A CD packaged with the ECU, contains both a Telemetry and Non Telemetry base map, for connection to Race Technology Products it is imperitive that the Telemetry base map is used as a starting point for the tune. 600 ECU must be v0.70D or later. The letter will not appear in the software, they need to look on the ECU itself. 710 ECU must be v0.70C or later. There were no non-working versions of 0.70 on the 710 so if it shows 0.70 in the software it will be fine. If your OMEX 710 ECU is running version 0.89 firmware or later your will need different firmware on your Race Technology ECU Serial Adapter. Please specify this when ordering or contact Race Technology if you require the alternative firmware for your ECU Serial Adapter.